A 16-year-old teenager died on a school field trip from toxic shock syndrome (TSS) in March 2017. The death appears to be linked to the teen’s tampon use. But what is toxic shock syndrome? And why is it linked to tampons? The young Canadian woman was on an overnight field trip with her classmates. She said she wasn’t feeling well and was having cramps, according to the local news. The next morning, she was found unresponsive in her bed, and tragically, she was unable to be revived by the paramedics. TSS is a rare condition – only 337 people were diagnosed in 2015, about 1 in 100,000 menstruating women. However, as seen above, TSS is life-threatening. It’s caused by toxins produced by bacteria — particularly Staphylococcus aureus (staph) and Streptococcus (strep). These bacteria often live on people’s skin without causing any symptoms, but under the right conditions, they can quickly grow and generate toxins. Toxic shock syndrome has been associated primarily with the use of superabsorbent tampons. Superabsorbent tampons may provide the right conditions for the bacteria to grow. If the tampons are left in longer than recommended, they can act like a petri dish for bacteria. To prevent TSS, change tampons at least every 4 to 8 hours, use the lowest-absorbency tampon needed for your period, use pads instead of tampons at night, and switch from tampons to pads during times of heaviest menstrual flow. About half of TSS cases are in menstruating women. 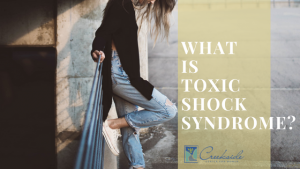 Toxic shock syndrome can affect anyone as risk factors for toxic shock syndrome include childbirth, skin wounds and surgery. If you have a dressing on a wound, change the dressing as often as is recommended. Call your doctor immediately if you have signs or symptoms of TSS, especially if you’ve recently used tampons or have a wound or skin infection. Creekside Center’s number is (479) 582-9268.